The Animal Enterprise Terrorism Act (AETA)( United States federal law (Pub.L. 109–374; 18 U.S.C. § 43) prohibits any person from engaging in certain conduct "for the purpose of damaging or interfering with the operations of an animal enterprise." The statute covers any act that either "damages or causes the loss of any real or personal property" or "places a person in reasonable fear" of injury. We support full enforcement of the Animal Enterprise Terrorism Act and we strongly condemn illegal actions such as the “liberation” of dogs or destruction of property. We support reasonable and enforceable laws that protect the welfare and health of dogs and do not restrict the rights of breeders and owners who meet their responsibilities. In conjunction with the American Kennel Club we oppose the concept of breeding permits, breeding bans or mandatory spay/neuter of purebred dogs, specifically those based on the number of dogs owned or maintained. We expect responsible dog owners and breeders to know, understand and obey laws that apply to them. We support the appropriate awarding of traditional economic damages in cases involving negligent injury to an animal. Together with criminal laws that prohibit animal cruelty and dog fighting, and civil laws that address both intentional and negligent injury or death of an animal, traditional economic damages in cases involving the negligent injury or death to an animal helps create a stable legal system that promotes responsible animal ownership, deters animal abuse, and promotes innovative, affordable, and quality animal care. We oppose the awarding of non-economic damages in cases involving the negligent injury to an animal. We support reasonable, enforceable, non-discriminatory laws to govern the ownership of dogs and we believe that dog owners should be responsible for their dogs. We support laws that: establish a fair process by which specific dogs are identified as “dangerous” based on stated, measurable actions; impose appropriate penalties on irresponsible owners; and establish a well-defined method for dealing with dogs proven to be dangerous. We believe that, if necessary, dogs proven to be “dangerous” may need to be humanely destroyed. We strongly oppose any legislation that determines a dog to be “dangerous” based on specific breeds or phenotypic classes of dogs. The Responsible Dog Owners of Maryland considers auctions and raffles not to be reasonable and appropriate methods to obtain or transfer dogs. The Responsible Dog Owners of Maryland support state laws making any form of participation in organized dog fights a felony. The RDO-MD unequivocally opposes dog fighting and the breeding and/or training of dogs for fighting. The RDO-MD opposes the training of dogs for uncontrolled aggressive behavior toward other dogs and people. The Responsible Dog Owners of Maryland recognize that ear cropping, tail docking, and dewclaw removal, as described in certain breed standards, are acceptable practices integral to defining and preserving breed character and/or enhancing good health. Appropriate veterinary care should be provided. The Federal Animal Welfare Act enforced by the U.S. Department of Agriculture (USDA) is intended to regulate wholesale breeders, dealers and caretakers of dogs. The USDA has regularly strengthened the standards for humane care and treatment of dogs and other animals by persons regulated under the Act. The Responsible Dog Owners of Maryland support increasing the number of USDA enforcement personnel dealing with wholesale dog operations and strong enforcement of the requirements of the Animal Welfare Act. The Responsible Dog Owners of Maryland believes that insurance companies should determine coverage of a dog-owning household based on the dog’s deeds, not the dog’s breed. If a dog is a well-behaved member of the household and the community, there is no reason to deny or cancel coverage. In fact, insurance companies should consider a dog an asset, a natural alarm system whose bark may deter intruders and prevent potential theft. Service dogs are defined as those that are individually trained to do work or perform tasks for people with disabilities. The Responsible Dog Owners of Maryland strongly support public accommodations that allow individuals with disabilities to use service dogs. The Responsible Dog Owners of Maryland strongly condemn characterizing dogs as service animals when they are not or attempting to benefit from a dog’s service dog status when the individual using the dog is not a person with a disability. The Responsible Dog Owners of Maryland emphatically support freedom of choice in selecting a pet. RDO-MD actively promotes efforts to ensure that people are educated, understand the demands of responsible ownership and have access to a pet that is right for them. RDO-MD strongly opposes any measure that restricts choice by compelling people and/or retailers to obtain pets solely from shelter or rescue distributors. 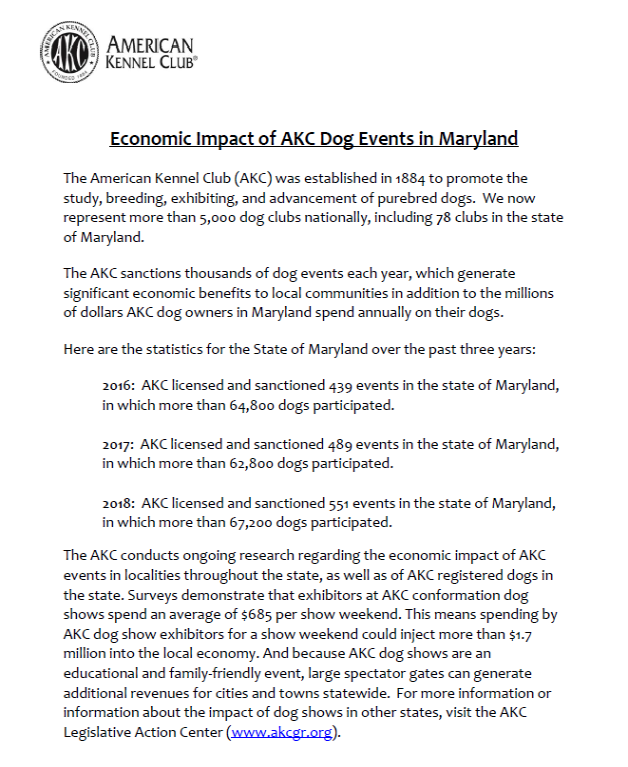 The Responsible Dog Owners of Maryland support preserving the future of purebred dogs. The RDO-MD is proud to advocate for purebred dogs, breeding for type and function, the sport of purebred dogs and for breeders who are committed to the health and wellbeing of dogs and preserving their unique breeds. The Responsible Dog Owners of Maryland believe that owning a dog is a rewarding experience that brings great joy and happiness to any household. With dog ownership comes long-term emotional and financial commitment and a variety of responsibilities. Accordingly, we encourage potential owners to closely evaluate their lifestyle before deciding to obtain a dog and to consider what dog will best suit them. The RDO-MD urges puppy purchasers to seek responsible, ethical breeders as resources for their dogs. We further encourage owners to provide proper care, training and socialization to ensure that their pets remain happy members of their family, respectable members of the community and well-mannered canine good citizens. The Responsible Dog Owners of Maryland oppose laws that mandate the spaying/neutering of dogs. Spaying/Neutering are major surgeries and the decision to spay or neuter a dog should be made by the dog’s owner in conjunction with their veterinarian. Recent scientific studies demonstrate that spaying/neutering, particularly before a dog is fully mature, may result in detrimental long-term health impacts.